From left to right, top to bottom, are espeon, umbreon, leafeon and glaceon. They're about 4.5" x 6" like the last ones have been. They look really great with all eight together, I wasn't sure if I should submit all of them together though since the first four are already up on their own. Hope you all like them too! are you leafclaw 02 on Youtube??? OMG!!! COOL!!! THESE 4 R MY FAV EEVEELUTIONS!!!! It's good, though Umbreon looks like he hasn't eaten well for a while, judging by how thin his legs are. DX It's still pretty good. I could never get that. amazing! the "eons" are my favorite pokemon! These are really nice! I love their individual expressions and backgrounds. Great work. 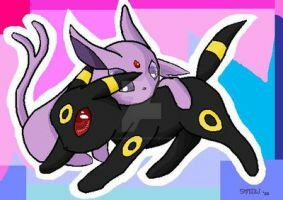 Espeon and Umbreon are my faves. Wow these are awesome! I love your style! Lovely picture. I think I like Espeon the most, though all are really well done. I WILL GO AND WORSHIP THIS PICTURE RIGHT NOW. Has anyone bought it yet? poor Glaceon looks like it needs a hug. *hugs*your so talented!! Wow! These look really really professional ! And even the other four! 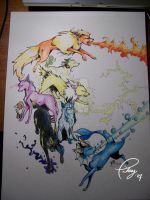 I love all the 8 eevees you did! OOOH I hope you get it! How does the buying things work?